Ninety minutes after a flawless Falcon 9 launch, landing, and payload deployment, SpaceX CEO Elon Musk took to Twitter to provide an update on the status of Mr. Steven’s latest payload fairing catch attempt. 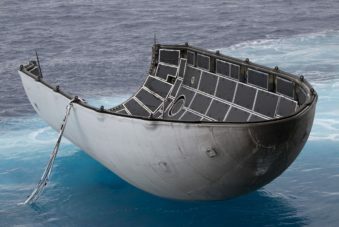 While sadly unsuccessful on the catch front, Musk noted that both fairing halves successfully performed gentle touchdowns on the ocean surface. 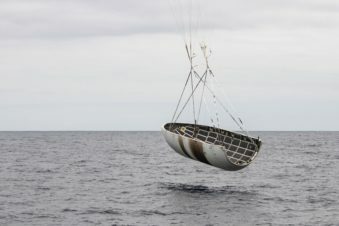 Far more importantly, the CEO implied that – counter to past ocean surface recoveries – SpaceX fairing engineers and technicians would instead attempt to dry and clean these particular fairing halves well enough that they can be reused on a future launch. Intriguingly, this is almost a 180-degree shift in SpaceX’s long-publicized attitude towards fairing recovery, where the implication was that fairing halves would wind up being unreusable if they could not be prevented from landing directly on the ocean surface. To some extent, this was a reasonable argument – thanks to the highly sensitive satellites they enclose, payload fairings must be able to support an internal atmosphere equivalent to a reasonably high-performance clean room while still weighing next to nothing. Falcon 9’s fairing halves weigh approximately 800 kg apiece and are large enough to enclose an entire school bus with plenty of room to spare. However, this narrative has not exactly been mirrored by prospective competitors, especially international technology manufacturer RUAG, which produces payload fairings and other composite assemblies for both ULA (United Launch Alliance) and Arianespace, SpaceX’s only serious commercial competitors. 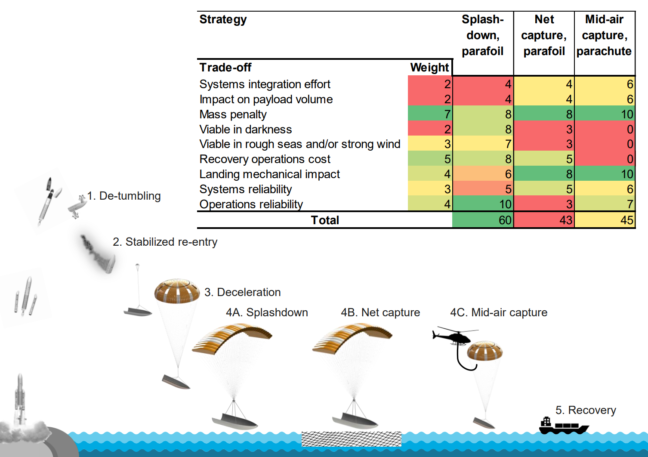 In a study released earlier this year, a RUAG-funded cost-benefit analysis concluded that the simplest, cheapest, and easiest route to fairing reuse would be simply finding ways to effectively waterproof and clean them after soft ocean landings. In a very literal sense, SpaceX has solved the hardest part of fairing recovery, essentially recovering fairing halves at all without catastrophic or irreparable structural damage in the process of reentering and landing. SpaceX already has a veritable fleet of soiled but wholly intact Falcon fairings, recovery by simply lifting them off the ocean surface after a gentle landing beneath each half’s guided parafoil. Much to its engineers’ chagrin, what SpaceX has yet to solve is the presumably extraordinarily challenging problem of guiding those parasailing fairings with extreme accuracy into Mr. Steven’s net, essentially the bullseye to end all bullseyes. While it would be both extremely exciting to see Mr. Steven’s visually and technically fascinating net assembly be put to good use and equally disappointing to see his capabilities no longer be needed, Musk’s comment after today’s launch as nothing short of a complete change in his attitude towards fairing recovery, suggesting that SpaceX’s engineers have been working on waterproofing and thorough cleaning as a backup to Mr. Steven’s admittedly Rube Goldberg-esque fairing recovery mechanism. Regardless of the avenue SpaceX takes, a reusable fairing is a still a reusable fairing, regardless of the gritty details of how that reusability is achieved. As Musk once rather hilariously noted, payload fairings are akin to a pallet of $5M plummeting through the air, a pallet that SpaceX would certainly like to recover. Perhaps, rather than catching that pallet of cash in a net, SpaceX can instead waterproof the bills and pick them up.